Egyptian Court Overturns Mubarak's Murder Conviction : The Two-Way It is not clear if the former strongman, who was ousted after massive anti-government protests in 2011, will walk free as he is also serving a separate 3-year sentence. Ousted Egyptian President Hosni Mubarak, 86, lies on a gurney next to his son, Gamal, second left, in the defendants cage, during a court hearing in Cairo, on Saturday. He and his sons saw earlier convictions on murder overturned by the court. A court in Egypt dismissed murder charges against former President Hosni Mubarak over the killing of hundreds of anti-government protesters during a 2011 Arab Spring uprising that ousted the long-time strongman. Citing a technicality, the appeals court overturned a 2012 conviction of Mubarak, now 86, his two sons, security chief and six top security commanders. He and his sons were also acquitted on corruption charges. 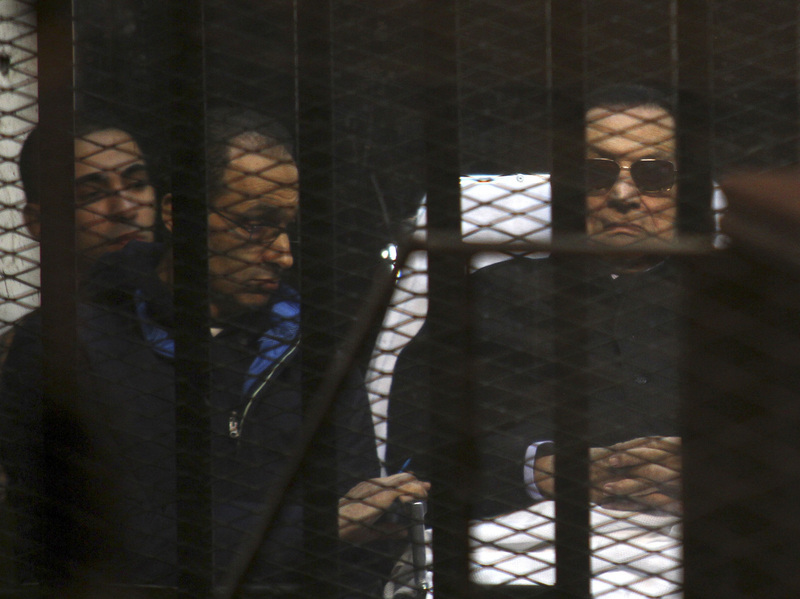 After his initial sentence, Mubarak had been serving a life sentence, which was later overturned. Mubarak, who rose to power in Egypt following Anwar Sadat's assassination in 1981, smiled when the verdict was read. He had been held at a military hospital and appeared in court on a stretcher. The Associated Press notes that it's "not immediately clear whether Mubarak would now walk free since he is serving a three-year jail term for corruption charges he was convicted of in May. He has been in detention since April 2011, but it is unclear if the past 3 1/2 years will be considered as time served." NPR's Leila Fadel says activists who risked their lives to protest Mubarak's autocratic regime see the original verdict's reversal as symbolic of a revolution that has been defeated. "Many Egyptians who lived through Mubarak's rule view it as a period of autocracy and crony capitalism and considered it a victory to see him behind bars." "Beyond the courtroom, many Egyptians said that the decision reflected the times. President Abdel Fattah el-Sisi, the former general who last year led the military takeover that ousted an elected Islamist government, has consolidated power as Egypt's new strongman and surrounded himself with former Mubarak ministers and advisers. "State-run and pro-government media now routinely denounce the pro-democracy activists who led the 2011 uprising as a "fifth column" out to undermine the state, while the Islamists who dominated the elections are now jailed and denounced as terrorists. "Legal experts said that the charges against Mr. Mubarak were flawed from the start because they were rushed to court to appease public demands for retribution against him after his ouster."